Even though Max is only 1 ½ years old, this little guy had lived with 3 families prior to coming to rescue. Max is still working on his housetraining, but other than that he is a very sweet little boy. This little guy has been through a lot in his short life, including a car accident. He is afraid of strangers, especially men. He is learning that a car ride is a fun event instead of worrying so much that the car will take him to yet another strange home. Max plays nicely with his fur buddies in his foster home. Unfortunately, Max needs lots of veterinary care. He has dry eye and had struvite crystals in his urine that are mostly under control now. He has two luxating patellas that need to be surgically corrected. Right now his knees don’t cause him too much trouble, but if he doesn’t have the surgery, his knees will continue to degenerate and eventually he’ll have terrible arthritis and perhaps be totally lame. Max also has upper airway syndrome, consisting of everted laryngeal saccules, an elongated soft palate, and stenotic nares. This means that Max has trouble breathing and snorts a lot. Fortunately, this condition is also correctable, but requires the help of a veterinary surgeon. Max is such a sweet and loving boy who hasn’t had a lot of luck in his short life. Now he’s in rescue and we are committed to making sure that he gets all the veterinary care he needs. The surgeries will be expensive, but Max is worth it! After he is all healed, he will be able to lead a long and happy life! Max is a really young dog and has a long life ahead of him. Can you help us to make Max's life a good one? The estimate at the vet college is $1600 to do the surgery for both legs and the estimate is $1400 for the upper airway surgery! Please help us by contributing what you can towards Max's surgery! Max says "Life is good at my foster home but Furever could use some help paying for my vet bills so I can have surgery to fix my legs". "I will love you forever and send lots of doggies kisses if you can help me"!! Update! Thank you so much to everyone who prayed for Max’s overall health and a safe and successful surgery today! Max is home now resting quietly and did great during surgery today. He had surgery for upper airway syndrome (stenotic nares, elongated soft palate, and everted laryngeal saccules). Max also did not experience the rather common complications associated with upper airway syndrome surgery and his recovery was smooth with no intubation or ICU stay necessary. Max is very tired right now and is sleeping like a log, but in about 2 weeks he’ll probably be feeling great and will be able to breathe better (which means more running and playing with his foster brothers!). We are so very relieved and happy for Max. He’s had such a hard life in his short 18 months here on earth. We wish to thankfully acknowledge all of Max's Sponsors and Special Angels who helped us so much in providing funds to pay all of Max's vet bills. You all were Max's angels and your support meant more than you can ever imagine to Max and his foster mom! Thanks to a lot of wonderful people we received enough donations to pay for all of Max's surgery bills and Max's Rescue now becomes one of our Sponsor Success Stories! For you, the Sponsors are what made this rescue a Success! We gratefully acknowledge the following contributors. Bonnie Arneberg sent a donation in Memory of Arnie, their beloved Cockapoo who passed away at age 15! Lilly and Sophie of Medford MA sent a donation for Max's Medical Fund! Karen Kuebler sent a donation for Max's Medical Fund! Hazel and Richard Patala sent a donation for Max's Medical Fund! James and Myrna Meador sent a donation for Max's Medical fund! Alan and Kathy Davis sent a donation for Max's Medical Fund! Ken and Karen Brown sent a donation for Max's Medical Fund! Lori Francis sent a donation in Honor of Jeane Doan's Graduation from Veterinary Technician School! 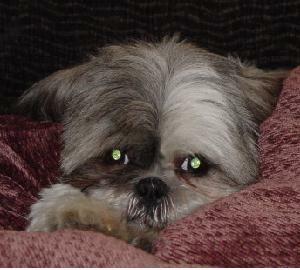 Joyce and Davida Heleher sent a donation for Max's Medical Fund in memory of Oliver, their beloved Shih Tzu! No reprints of this story without the expressed written permission of the author, stevec1915@aol.com.